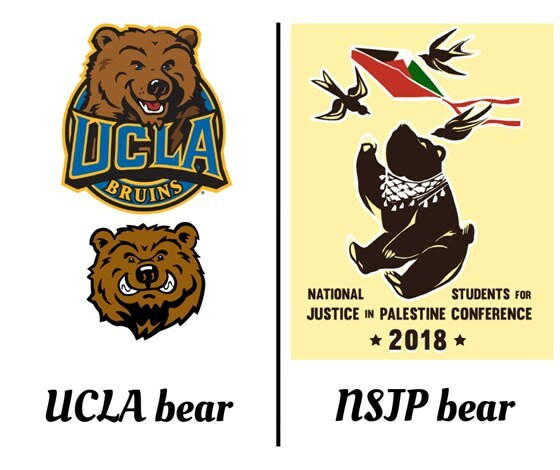 Last week, the University of California, Los Angeles sent a cease and desist letter demanding that National Students for Justice in Palestine stop use of the name “UCLA” or an image of a bear with a kite in connection with a conference the organization is holding on UCLA’s campus. UCLA’s threat to cancel the conference, citing a dubious California law, was a departure from an earlier letter sent by the university’s chancellor to a congressman who called for the conference’s cancellation. Now, just as UCLA appears poised to relent on its threat — after receiving a letter from the ACLU of Southern California and Palestine Legal, as well as a slight modification of one of the images promoting the conference — the Los Angeles City Council is joining the chorus of voices calling for cancellation of the conference. Tod M. Tamberg, a spokesman for UCLA told NBC News in an email on Wednesday “it was never about the bear all by itself” and that it appreciated the groups [sic] alteration to remove the UCLA name. The university, which threatened to cancel the conference, also said that the event would go on as scheduled. As we reported last week, UCLA’s threat followed calls from critics of SJP and a Los Angeles-area congressman, Rep. Brad Sherman, to cancel the event. Others have echoed those calls or expanded on them to demand that the university sanction and investigate its SJP chapter. Add the City of Los Angeles to the government actors calling on UCLA to cancel the convention. While dubious California statutes and trademark concerns falter, the Los Angeles City Council has issued an internally incoherent resolution recognizing that the university has First Amendment obligations while demanding that the conference be canceled, First Amendment be damned. The resolution recites — as did Rep. Brad Sherman’s letter — examples of criticism of the state of Israel as falling within the State Department definition of anti-Semitism. It’s unclear whether the Department of Education’s Office for Civil Rights uses this definition. As FIRE has repeatedly pointed out, these examples encompass political expression unquestionably protected under the First Amendment, and the Office for Civil Rights’ use of this definition as a legal yardstick will generate pressure on public institutions to censor protected political speech. The resolution’s author, Councilman Paul Koretz, whose district includes UCLA, also sent a letter to the university’s chancellor. That letter is not publicly available. Presumably, it raises the same arguments raised in Rep. Sherman’s letter and the resolution: that some members of SJP have engaged in objectionable speech or unlawful conduct, so a conference open only to SJP and its supporters should be canceled. But the First Amendment does not abide guilt by association or the foreclosure of speech rights because of past bad acts. UCLA must continue to reject calls — whether from public officials or critics on and off campus — to ignore its First Amendment obligations by canceling the conference.